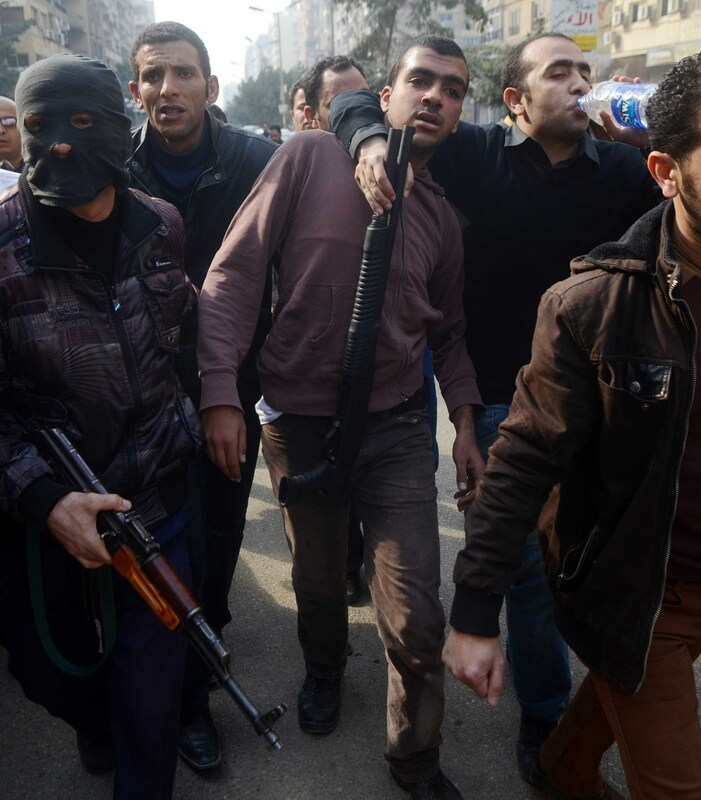 Egyptian police arrest a protester (C) following a demonstration in the Nasr City district of Cairo, on January 25, 2014. An appeals court acquitted on Sunday 64 of 68 detainees, including four political activists, arrested during protests commemorating the third anniversary of the 25 January Revolution. The Azbakeya Court of Appeals accepted the defendants’ appeal to their initial sentences, reported state-run Al-Ahram. The remaining four defendants, all students, failed to attend Sunday’s trial session due to final examinations. Their verdict has been postponed to 6 July, Al-Ahram reported. All 68 defendants were sentenced to two year’s hard labour in March. Seventy-nine defendants have been held at the Abu Zaabal Prison since January and tried by Azbakeya Misdemeanour Court for protesting without a notice, illegal assembly, stalling traffic and displaying force. The four activists were moved from Abu Zaabal Prison to Tora Prison after complaining to the prosecution of torture during a detention renewal session on 9 February. Over 1,000 protesters were arrested during demonstrations marking the third anniversary of the revolution. Their detention conditions have been condemned by several human rights organisations, including Amnesty International. The Ministry of Interior, however, denied torture allegations reported by those who had been preventively detained.